Why not think of this as two weeks’ worth of Wordless Wednesdays? (try saying that five times fast!). Though, because I tend to be incredibly verbose, I’ve given up on the Wordless part. I’ve really grown to like the Mio infusion set, and have been using it for every third or fourth site-change until I deplete my supply of the other kind. Knowing it’s about time to switch makes me feel a little down. This isn’t the post that went up last week. My actual post from last Wednesday was of a purple ketone strip and a misguided CGM reading, which turned out to be a consequence of the above. Since I was running on empty, I did a set-change last Tuesday, and the new Sure-T that I inserted failed me. So at 3 o’clock in the morning, I replaced it with a Silhouette. An angled, long-needled, irritatingly familiar Silhouette. A Silhouette that comes with 42-inches of glorious tubing (ten inches more than the leading brand). Not wanting to go through the whole tube-fill procedure again when I could’ve been sleeping, I unplugged the 32-inch Sure-T tubing from the bum infusion set and plugged it into the freshly inserted Sil. 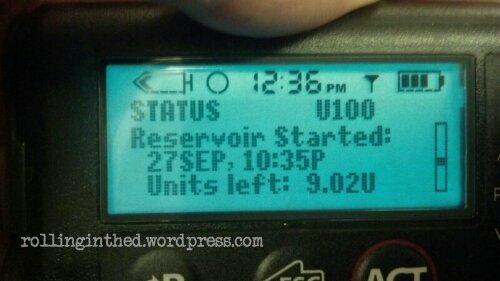 (Hopefully, I remembered to fill the cannula with 0.7 units, but in hindsight, I’m not so sure I did). I saved the 42-inch tubing for later. Sometime over the next few days, it was time for that Sil to go, and I put in another Sure-T. But rather than use the included tubing, I retrieved the precious 42-inch tubing that I had stashed away. I’ve really grown to like the 42-inch pump tubing. Sadly, they don’t come with any of my preferred infusion sets, but occasionally I get to bask in its luxurious comforts. Knowing I’ve soon got to switch makes me feel a little down. 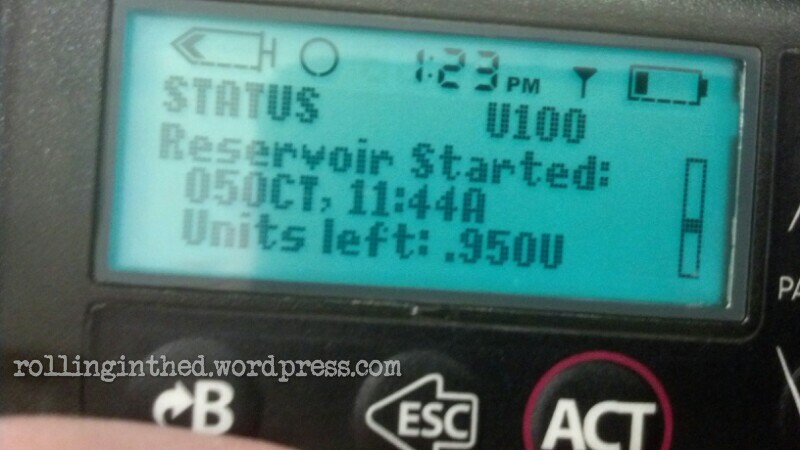 Posted on October 9, 2013, in Diabetes, Insulin pump, Wordless Wednesday and tagged mio. Bookmark the permalink. 4 Comments. I generally keep the pump clipped to my belt and the infusion site/connection point somewhere near my abdomen area. The tubing gets stuffed inside my waistband. As mens’ shirts tend to be longer than womens’, I need enough length to go down around the bottom of the outside my shirt and up along the inside. Also, as I mentioned, it helps in “particular cases” where I’m not wearing my pants around my waist…. “I could poop without securing my pump safely in my shirt pocket or in my mouth (ewww, I know )” — I’m dying laughing. I’m liking the 32″ one. I used to be a 23″ girl, but a lot of times, I couldn’t put the pump where I wanted it it. Now if I need to stash it “up top” I can while the site is in my leg.